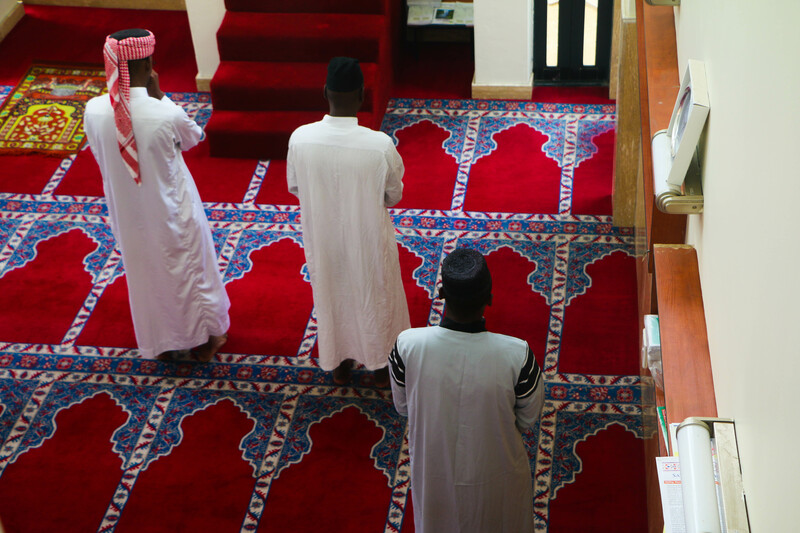 For the Islamic community of Orlando East, living in a community that has misconceptions and suspicions about their choice of religion is an everyday reality. It is 12:30 midday on the corner of the Mosaka and Mofutsunyana streets in Orlando East, Soweto. Taxis are passing and dropping off commuters on the main road, Mosaka Street. At the corner of these streets is a three-storey mosque, a modern structure which is noticeable by the minaret with a crescent moon towering over Mosaka Street, which is visible from a distance. A devout Muslim, Ibrahim, also known as Mpho, who converted to Islam 14 years ago, walks into a small room where a microphone is positioned against a wall. Ibrahim’s voice echoes through the speakers above the mosque as he recites a call for prayer in Arabic. Minutes after the call, men dressed in ankle-length robes and women dressed in hijabs emerge from the corner of the street. The quietness and the peaceful nature inside the mosque contrasts with the busy main road, the constant traffic of passing cars and pedestrians. 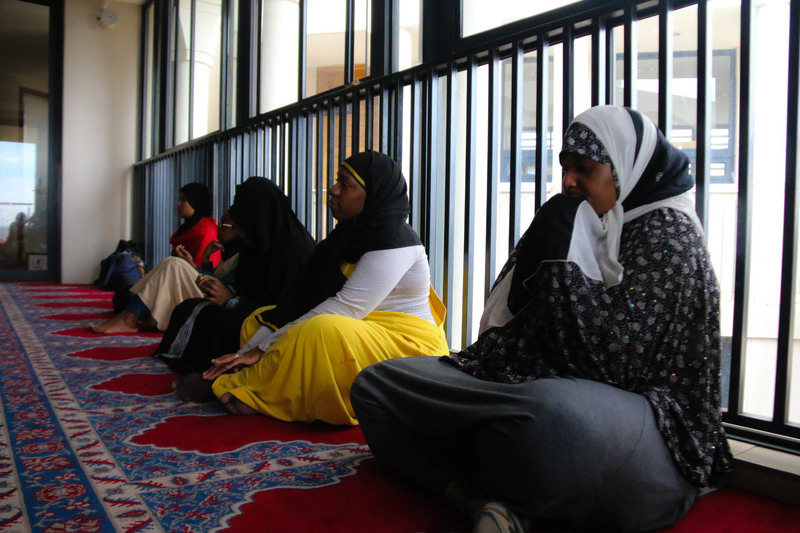 WOMEN OF THE MASJID:The men and women at the Masjid (mosque), have separate prayer rooms known as a musalla. The women are seated on the floor while listening to Imam Zayd giving a teaching through a speaker in the room. What stands out about this community of Muslims is that they are mostly black township converts who were not born into the religion of Islam. As much as Muslims are recognised members of the community their religion and way of life also makes them stand out in a community of people that share similar identities. MUSALLA:Prayer at the mosque take place several times a day. The men pray and hold teachings in a wide room on the ground floor and the musalla for women is on the floor above. The Imam, who is the leader of the mosque, a young black man, draped in a white robe, walks into the room. Imam Zayd, born as Tsholofelo Raymond Mashele. He positions himself on a stair case that is leaning against the wall, known to the Muslim community as the minbar. In his teaching, he keeps re-iterating “Islam is not a religion. It’s a way of life”. A way of life that is not fully understood by the community on Mosaka and Mofutsunyana Streets. As Imam Zayd gives his teaching, the congregation is seated on the carpet and listening attentively. In the background, the faded sounds of Kwaito and House music from the neighbouring houses are audible, the congregation oblivious to what could also be a distraction. Before entering the musalla, members enter a bathroom-like room to perform ablutions, an act of cleansing the body, so that one can present themselves to God, clean and pure. After ablutions the members take off their shoes and place them on a shelf before entering the area. 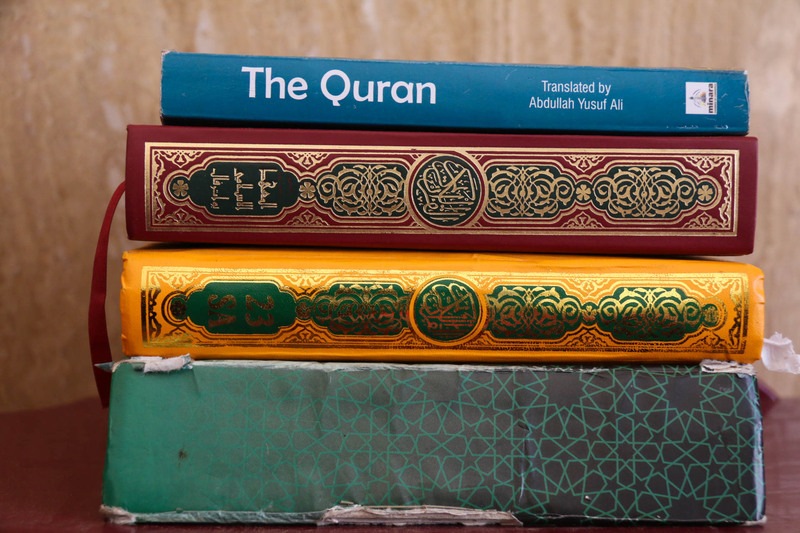 A GUIDE TO LIFE: The Orlando East mosque has copies of the Quran in Arabic, English and Indigenous South Africa languages. A silence fills the room as a young woman wearing an all back niqab, walks into the musulla/praying area. This is Somaya, the wife of the Imam. She greets the other women in the room by saying As-Salamu-Alaykum which means “Peace be upon you”. In a perfectly carpeted and unadorned room, the women sit in a straight line, leaning against the window as they listen to Imam Zayd give a teaching through the loud speakers in the room. 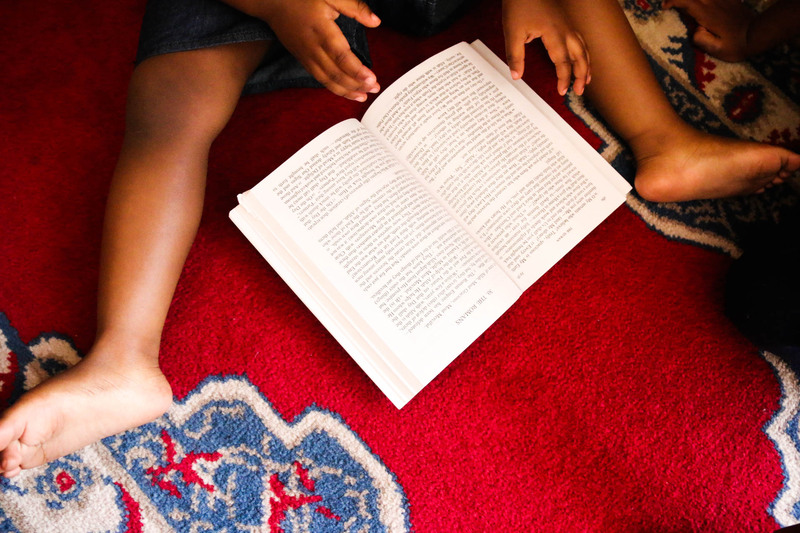 With a toddler on her lap, Somaya, explains that women are not allowed to be in the main musalla hence they listen to the teachings in a separate room. As the women kneel on the red carpet facing a large glass window covered in a black-grey curtain, in a large hall below, the men are seen through the glass window, kneeling down with their heads facing the minbar. After the service Imam Zaydsits down on the carpet to talk about his journey as a black Islam convert, “I was born in a Christian home, and I accepted Islam at the age of 16, in grade 11. After matric I went to study at an Islamic institute in Zachariah Park. My responsibility here is to guide Muslims. In Islam as Imams we are more like scholars. If a person needs something they come to me, if they want to get married, they come to me,” Imam Zayd says. “Islam is easier for black converters than one anyone else,” alluding to the similarities in historical African traditions. “In African culture a women could not leave the house without wearing a head wrap, it’s the same in Islam,” says Imam Zayd. There are contradictions that come with being a converted Muslim who comes from a different religious and cultural background. Imam Zayd says that he has communicated the contradictions with his Christian family. “When you’re born in a Christian home they bury you in a certain way. In Islam when you pass away, we bury you on that day. My family knows that if I die today, they must bury me today and they must respect that. You can’t go against the words of the deceased.” Zayd says that although his family initially was not in support of his conversion, they also respect his wishes as a devout Muslim. 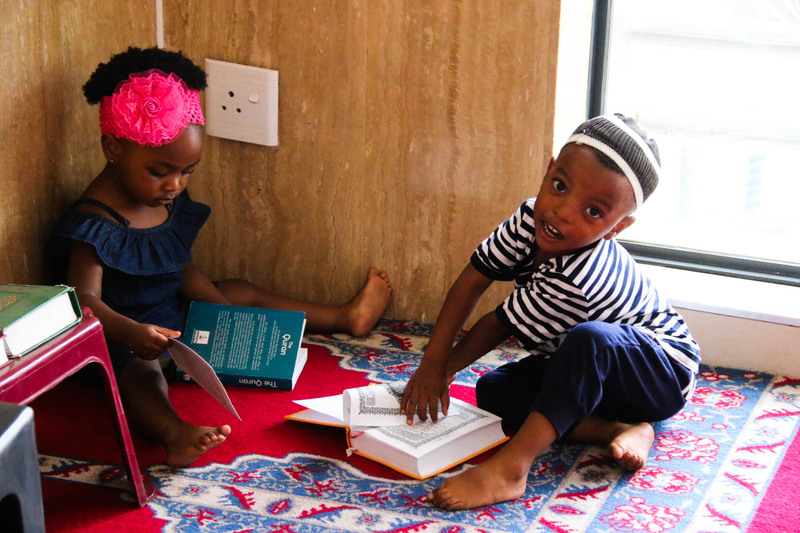 ISLAMIC UPBRINGING: From left, Zaynab Mashele and Njabulo Sithole playfully paging through the copies of the Quran during the Friday afternoon service. Somaya says, “When people see black Muslims, especially female black Muslims, they always assume that you converted because you’re married to an Indian. When I’m walking at the mall or in town people always stare and ask questions, they’re always shocked then they hear me speak Setswana fluently.” She also says she was born into a Muslim family in Soshanguve however her family did not actively practise the religion, she says she decided to fully practise Islam in 2006. “In Soshanguve they always knew that I was Muslim but it’s only when I started covering my face with a niqab that people started staring and making remarks,” she says. “Muslims are not seen as part of the community, in the township. That’s why we’re trying to show people that we are a part of you, we’re South African but we chose a different religion that you don’t understand,” Imam Zayd says. The Orlando East mosque was completed and opened in 2011 after much contestation from surrounding neighbours who say they were not informed about the establishment of the mosque. Today, the residents are still not aware of what happens inside of the mosque. Some of the residents had interesting observations about what Muslims do in the mosque. The call for prayer happens several times a day, however, the sound of the call is gentle. Imam Zayd says they had to lower the sound of the call to accommodate residents after they had complained several times. “When we do it loudly, we want to make sure that the Muslims who do not live within the vicinity of the masjid can hear that it is now time for prayer.” Zayd points out that “A person can say I’m not afraid to practise my religion, so I can make it as loud as I want. Why does no one complain when the Christians are ringing the bell? The plot where the mosque is built was originally a gaming store, the owner of the store was Muslim. According to the residents, the game store was a cornerstone of the community because the youth used it as a recreational space where children go to the store to play video games to avoid playing in the busy Mosaka Street. In 2011, The Star reported that some of the residents within the vicinity of the mosque had signed a petition and wrote letters to the City of Joburg, objecting to the construction of the mosque. The Muslim community’s efforts to integrate themselves within the Orlando East community are visible through the Mtholampilo Clinic which has become an important player in the community of Orlando East. This is one of the several community outreach efforts that the Orlando East Muslim community is involved in. Kgodisang says the mosque is also involved in a feeding scheme at a primary school in the area as well as doing blanket drives in the winter to assist members of the community who are in need. After his teaching, Zayd is seated on the carpet of the musalla with his legs crossed, talking about the modest nature of Islam. Two women walk in bringing plates of dry yellow rice mixed with boiled potatoes and mixed vegetables. Zayd mentions there are no Halaal butcheries in Orlando East and that Muslims in the area travel to places such as Mayfair near the CBD to get Halaal meat. One of the plans of the Muslim community of Orlando East is to hold a door-to-door open day to spread the teachings of Islam in the area. Imam Zayd says they aim to introduce Islam to the community because people do not know Islam. “They assume that Islam is an Indian religion. We already had Islam before Indians, specifically in Northern Africa. Christianity came to South Africa because of the Dutch and English,” he says. After the service the women, make small talk in Setswana and isiXhosa with one another as they move out of the musalla to put on their shoes which are carefully placed on a wooden shoe shelf. Exiting the tranquil environment of the mosque, the Muslims of Orlando East return to the sound of taxis and children laughing on their way back from school. For the Muslim community of Orlando East, outside of the spiritual calmness of the mosque, this is where they, too, are at home and where they belong. They are much as part of this community of Orlando East as everyone else.